Our vacation homes are stocked in such a way that you always feel like you are coming "home" to your "vacation home" rather than returning to a small hotel room. Our homes have full kitchens, with some homes having game rooms, pools, hot tubs and BBQ grills. You will be able to enjoy a full service home, while you are on vacation, rather than a small cramped hotel room. To Reserve a Vacation Home, select the dates you are looking for to see which houses are available. You can either book directly on this website by using the "check availability box" to the left. Or you can call our office at 305-393-3004 and a receptionist will be glad to help you. We implement a variety of security measures to maintain the safety of your personal information when you make a reservation. We offer the use of a secure server, all supplied credit card/sensitive information is transmitted via Secure Socket Layer (SSL) technology, and then encrypted into our payment gateway providers database. It will only be accessible by those authorized with special rights to such systems, and they are required to keep the information confidential. After a transaction, your private information (credit cards, social security numbers, financials, etc.) will not be stored on our servers. What is the Payment breakdown? The Initial deposit is half down, with the final payment due 90 days prior to stay. All reservations made 90 days prior to stay, will require balance to be paid in full. Payments can be made via Visa, MasterCard or Discover. Is there a Security Deposit? What is an Insurance Damage Waiver Policy? An Insurance Damage Waiver Policy replaces your Security Deposit. The cost for the Insurance Damage Waiver is $99, if you select this option, and will be added into the total cost of your stay. However, if you opt out of the Insurance Damage Waiver, a Refundable $3000 deposit is required, and will be added to the total cost of the reservation. To learn more about the Damage Waiver Policy, please select the "Vacation Protection" tab on the Home Screen. We highly recommend protecting your vacation investment with our CSA Travel Insurance, in the event that a cancellation is necessary. Travel insurance provides reimbursement if your trip must be canceled or interrupted. Covered reasons would include but are not limited to the following: Mandatory Hurricane Evacuations, travel delays, sickness, injury or death, armed services relocation, and more. To see a full list of coverage and to learn more about the CSA Travel Insurance we offer, please select the "Vacation Protection" tab on the home screen. A 12.5% tax will be charged. There is a 7.5% Monroe County sales tax and a 5% Florida Bed Tax totaling 12.5%. Yes, there is a $100 fee. We have a 7 night minimum stay. Do the houses have Occupancy Limits? Yes, the maximum occupancy of any vacation home cannot exceed two (2) persons per bedroom plus two (2) additional persons. Unfortunately, our homes are not pet friendly. How do I receive arrival and departure information? Prior to arrival, we email specific information about arrival time and directions. 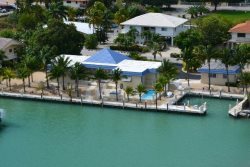 All of our homes are equipped with either boat dockage on site, or within walking distance of the vacation home. Please check listing info for specific details. Only two (2) vehicles allowed at duplexes. NO motor homes, campers, sport utility vehicles, or any other motor vehicle that can be used for sleeping are allowed. We highly recommend protecting your vacation investment with our CSA Travel Insurance, in the event that a cancellation is necessary. If you are concerned about unexpected events such as Hurricane Evacuations, travel delays, family illness and other emergencies, please select our CSA Travel Insurance. For more information on our CSA Travel Insurance, please select the "Vacation Protection" tab on the Home screen.